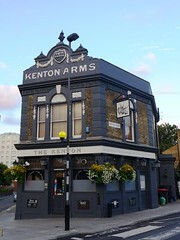 Pub in Homerton, formerly called The Kenton Arms (as is still clear from the building). Following a makeover around 2010, this is now a buzzing gentrified local, with music playing, colourful decoration, and plenty of people in on a Sunday afternoon. The main room curves around the bar, with a range of tables and some stool seating, and there's a separate smaller room towards the back (with lots of sofas), as well as a beer garden with three tables and a covered almost-interior area with sofas (perhaps a former garage). There are only two handpulls for ale, dispensing Doom Bar (£3.30/pint) and Landlord, though the latter was off on Ewan's September 2011 visit; the same two ales were available a year later. However, the Doom Bar is decently kept. Draught taps also dispense Staropramen, Leffe, Hoegaarden, Beck's Vier and other keg beers. The food offer involves roasts on Sundays (£12), and Pieminister pies on other days. Ewan tried a lamb roast in September 2011 (all the others were sold out by late afternoon when I arrived) photo, which was colourfully-presented and pretty good. Signage advertises a pub quiz on Tuesdays starting at 8pm, a film night on Mondays at 9pm, and live music Wednesday. According to the 2012 Good Beer Guide, it's also dog-friendly, and there are board games, and free wifi. Note that it doesn't open until mid-afternoon on weekdays. Last visited by Ewan, Kat, Sarah and others, August 2012. Opening hours taken from the Kenton website, August 2015. Last edited 2015-08-27 06:22:40 (version 10; diff). List all versions. Page last edited 2015-08-27 06:22:40 (version 10).